No holiday gathering would be complete without a few board games. 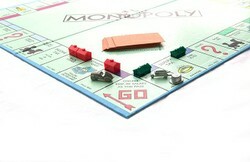 This year take yuletide to the next level with these Christmas Monopoly Editions. No holiday gathering would be complete without a few board games. This year, take yuletide to the next level with these Christmas Monopoly Editions. There is sure to be a version for every family’s personality within these selections. And, they are an inexpensive investment that can be enjoyed year-round. Christmas-opoly will have you in the holiday spirit year-round. Players can buy up properties. They can also purchase presents that can later be traded in for a Christmas tree. Dangers to avoid in this version include blowing a fuse, getting snowed in or being sent to “Naughty” and having to sit out three turns. This game includes the classic rules, but can also be turned into a quick 60-minute game. Monopoly A Christmas Story incorporates memory-invoking game pieces relating to the classic movie: a bar of soap, Ralphie’s bunny suit, the infamous leg lamp, Santa’s boot, broken glasses and an old man’s car. This game will have players reliving the hilarious moments from this timeless holiday film. Whoville-opoly is a “Seussified” version of Monopoly. Who Presents and Who Trees replace the real estate in this themed game. The properties incorporate lines and objects from “How the Grinch Stole Christmas.” Who Loot is aplenty in this holiday-themed game. Rudolph the Red-Nosed Reindeer Monopoly will have players stepping into the characters Rudolph, Santa, Hermey, Yukon Cornelius, Bumble, or Sam the Snowman as they work towards saving Christmas from cancellation. Relive the memories of the longest-running holiday TV special as you buy, sell and trade the Toy Workshop, Abominable Mountains and Christmastown. Tim Burton's The Nightmare Before Christmas Collector’s Edition Monopoly may not be what typically comes to mind when thinking of the holiday season, but it is a must have for “The Nightmare Before Christmas” and Monopoly collectors alike. This game features film photography and collectible tokens in the form of Jack’s Skull, Sally, the Mayor’s Hearse, Oogie Boogi, Zombie Duck and Evil Teddy. What's Your Favorite Monopoly Memory?